After a long thought, yesterday I've decided to follow my friend to go climbing for the first time. It was a bouldering gym called MadMonkeyz located in Wangsa Maju. I didn't thought it would be interesting, but I was wrong. Before this, I look climbing as a dangerous sport and what you need to do is climb to the top. But now I realized that climbing is not just about that. It's about strength, techniques, technical, and the trickiest part is, solving the puzzle of route. 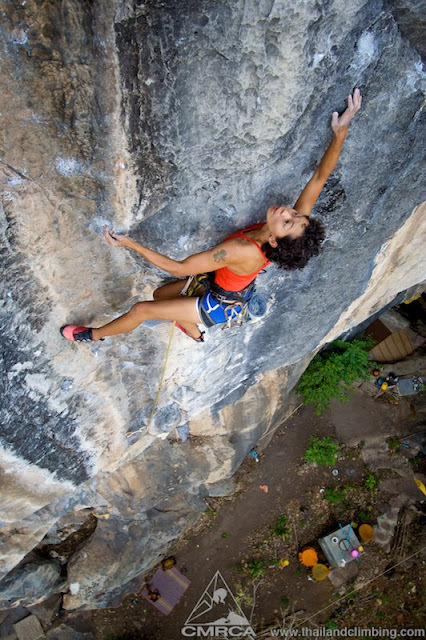 Regardless of rock or wall, boulder is a type of climbing where people climb without rope. 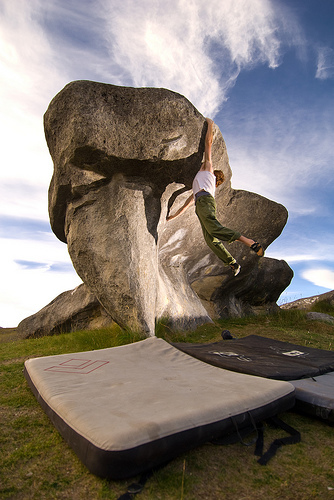 Most of the time, bouldering is not about going high, but it is about traversing on the route of rock or wall. All you need is a climbing shoe and chalk. In terms of safety, usually people bring a boulder mattress in case of unplanned falling. But in boulder gym, the floor usually covered with tick mattress. Bouldering is about getting the strength and stamina, sharpen your climbing techniques, and solving the puzzle of the route. From the name itself, top rope require us to use climbing rope where the rope will be intersect between the climber and belayer by the top anchor. Top roping is commonly done by beginner in climbing where they tries get familiar with the technical side of climbing, its safety measurement, and getting on top and fight the fear of height. Top roping require us to have at least 2 people where the 1st person as a climber and the other one as a belayer. Belayer is a person who will be on the ground and tighten the rope as the climber getting higher. Other than climbing rope, we also need to have harnesses for climber and belayer, and a belay device. In a safety perspective, in case of falling, climber will depends on the climbing rope, harness and belayer. Climbing rope, mostly use a dynamic rope, will help absorb the climber's falling inertia and usually it can support up to 5 - 10 kN which is around 5 - 10 tonnes. Same goes to harness where it has its own scale of supported weight. As for belayer and his belay device, he plays a vital role in safeness of the climber. With a good condition belay device, as well as attention in belaying steps, it will help climber to have a safe journey to the top. For those who are getting to the next step of adventure in climbing, lead climbing is the answer. 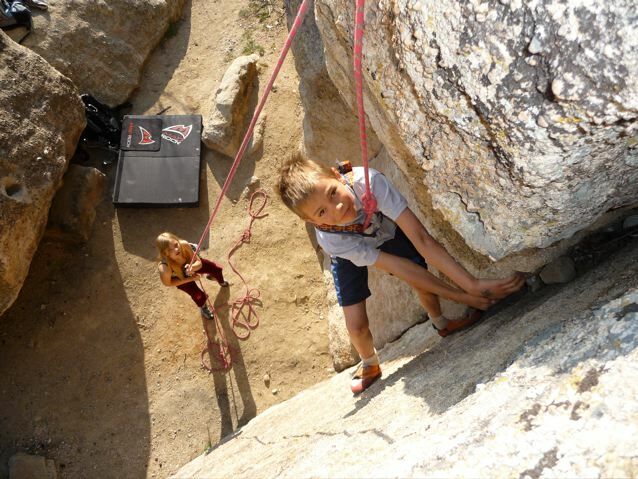 Most of the time, after getting an improvement in climbing techniques, understanding of technical part and its safety measurement, people tends to move to lead climbing. Similar to top roping, lead climbing require 2 persons (climber and belayer), rope(s), harnesses, and belay device, and its about getting to the top of the route. What makes it a bit different and adventurous than top roping is, it require addition equipments such as quickdraws, sling rope, more carabiners. Unlike top rope where the rope is already in the top anchor, lead climbing will start its rope from the ground where the climber will place the quickdraw and rope attached to his harness every times he gets higher. Means that, each time the climber go up, the last anchor for his rope will be below him. In terms of safety, lead climbing will need both climber and belayer's understanding of technical part of each gear and the route. Getting the rope too slack will endanger the climber, getting too tight will make the climber hard to move and/or put the rope on quickdraw. A good communication and understanding between climber and belayer will makes a climbing a great experience.